Nicolas Roofing and Building Maintenance is a small family run business that prides itself on its reputation. We have been in the trade over 17 years and most our work comes from recommendations from previous customers. You can trust us to be reliable, courteous and competitively priced, while always using the highest quality materials. 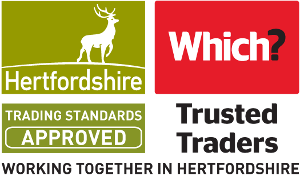 As a Which Trusted Trader I'm backed by trading standards and have a clear CRB check. We also have public liability, waste carriers licence and guarantee all our work. We work on private and commercial properties and undertake all aspects of roofing and building maintenance. All our quotations are no obligation and free of charge. We take photos of any work carried out before and after. Another service we provide is detailed roof surveys. Mr. Dunn has built an absolutely great car port for me. He completed it in two days at a very reasonable price. It is th envy of our neighbours & family. Cannot thank him enough for his hard work & would recommend him to anyone. Had our half of two chimneys repointed and repaired. Bricks were replaced with matching ones and it is clear that care and attention was given to the work. Nic cleared up and took away the resultant debris and cleared the guttering out. Overall a high quality, friendly and professional service. I'd be happy to recommend. Nicholas did a very thorough job on re-felting the flat roof of our extension, replacing soffit boards, repairing gutter and painting the eves. He is very friendly and polite. He discussed the job before submitting his estimate and is very knowledgeable, experienced honest and trustworthy. We would have no hesitation in using him again. Nic was very professional and reliable, he gave a very competitive quote to repair my chimney and did an excellent job. He took photos before and after and thoroughly explained what needed doing. He cleaned the gutters and swept the patio when finished. I would use Nic again and definitely recommend him. Just wanted to say what an efficient friendly gentleman he was, mum had issue with her guttering and was great to be able to feel that we had someone around who was professional and trustworthy. Highly recommended. My neighbour and I decided that our attached garages required a complete roof renewal. We both agreed on the quote received from Nicolas who has recently completed the job in two days. I do not normally do trip advisor or similar review sites, but I think it appropriate to highly recommend Nicolas. He is reliable, competent, professional, polite and very hard working. His knowledge of the business is remarkable. Both my neighbour and I are very pleased with the new roof. Another neighbour recently commented on the good work and is considering as to whether his roof is due for replacement! Everything was completed as per the quotation and all debris thoroughly cleared from the site. Great work Nicolas. After phoning Nicolas, he came round promptly and emailed a very competitive quote the next day. He is hard-working and professtional and did a great job on a tricky roof. He is very tidy and friendly and I would have no hesitation in recommending him. We have just had our fascias, soffits, guttering and roof de-mossed by Nicolas Roofing. Plus cast iron down pipes re-furbished. He did an absolutely fantastic job, was on time every day, very good attention to detail, plus left everything neat and tidy at the end of the day. And a very competitive price. Would highly recommend! We used Nicolas Roofing to repair part of our roof /replace broken tiles and also to clear moss from the roof. They did an excellent job - hard working, friendly, extremely tidy and reasonably priced.